Not many people can say they’ve entered into retirement plans early. 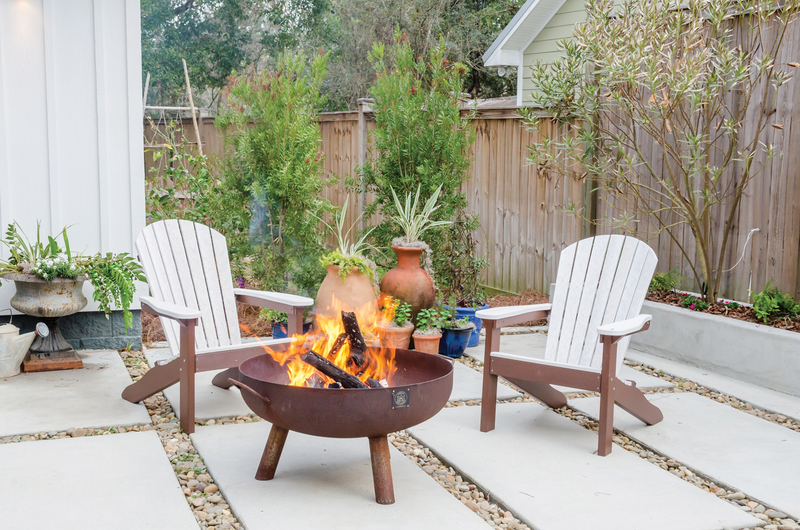 And while Mike and Tamatha McElmurry are hardly retired, they did stumble upon their retirement dream lot, and upon it, they built a dream home. Ten years ago, the couple was visiting some dear friends on School Street in Fairhope when they spotted the lot. It had a dilapidated house on it and seemed to have been forgotten. So they approached the owner and tried to purchase it, but the owner politely refused. A few years later, the property went up for sale, and the McElmurrys leapt at the option, placing a blind offer on it amidst five others. “We didn’t think it was going to happen for us, but he accepted our offer, ” Tamatha recalls. ​Tamatha began selling real estate in 1996, the same year Mike got his start in home building. 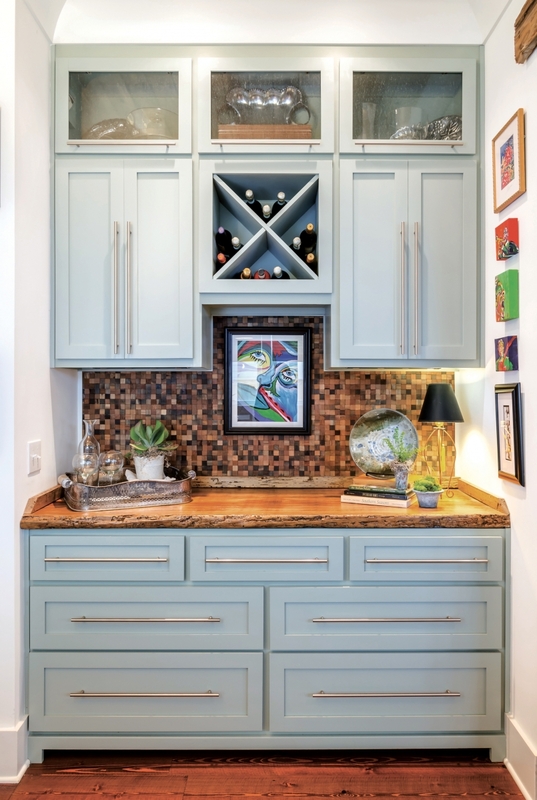 She laughs, “This is when I took on the role of designer/decorator as my ‘hobby.’” The pair work together on all their building projects, with Tamatha designing the space and finishes while Mike handled the build. 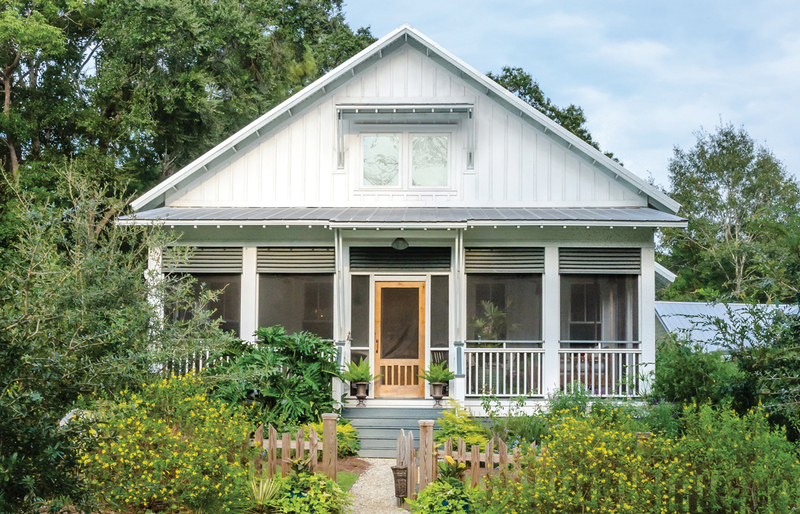 They drew from this depth of experience to build their own home, a process that is full of both highs and lows. “After building for 20 years, we have learned to take the challenges in stride, ” Mike says. 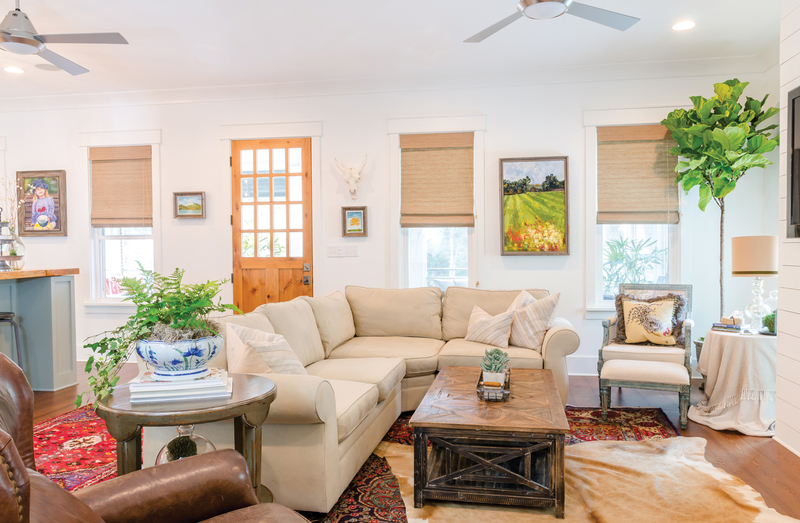 The couple envisioned a modernized coastal cottage that would look like it belonged in downtown Fairhope and near the Bay. 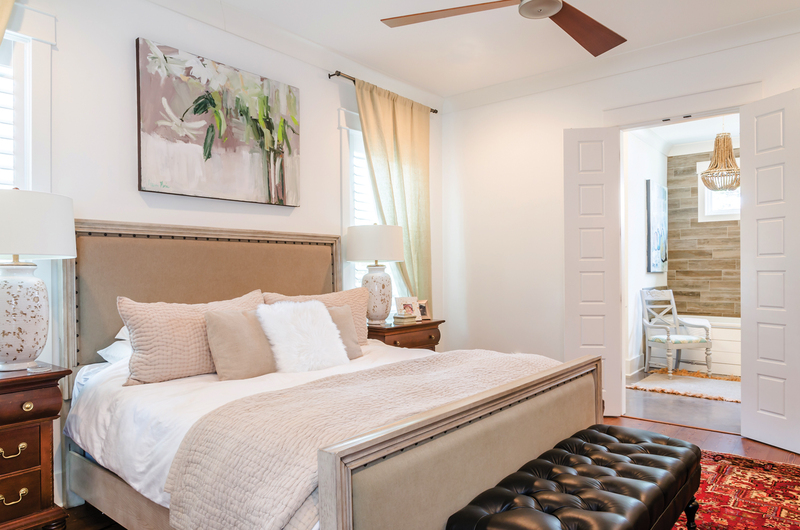 “Mike and I collaborated on each room to incorporate all the natural, traditional and modern elements we envisioned, ” Tamatha says. 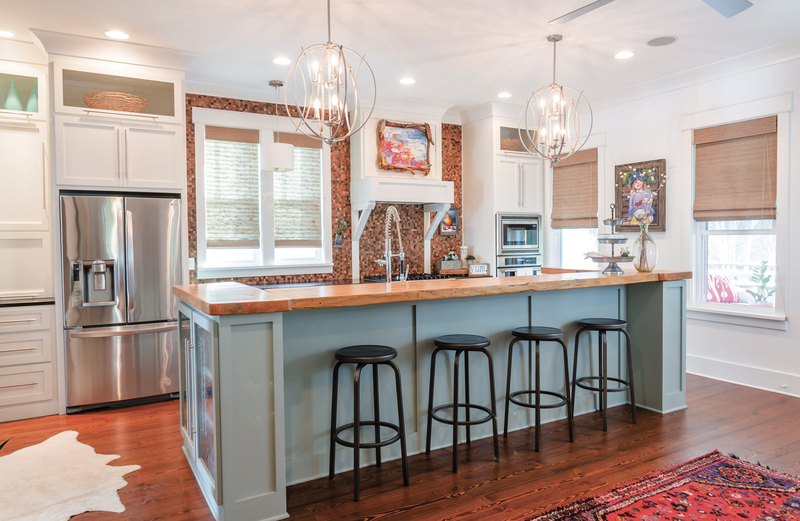 Mike adds, “We wanted an open concept that would flow well for dining and entertaining.” They also wanted outdoor living areas that would serve them just as well when their two teenage daughters would soon leave for college. Most afternoons you’ll find the girls on the porch napping or working on homework and at night hanging out there with friends. As Tamatha simply says, “We like it that way.” But while the couple might soon be empty nesters, they’ll still have a bit of company at home. 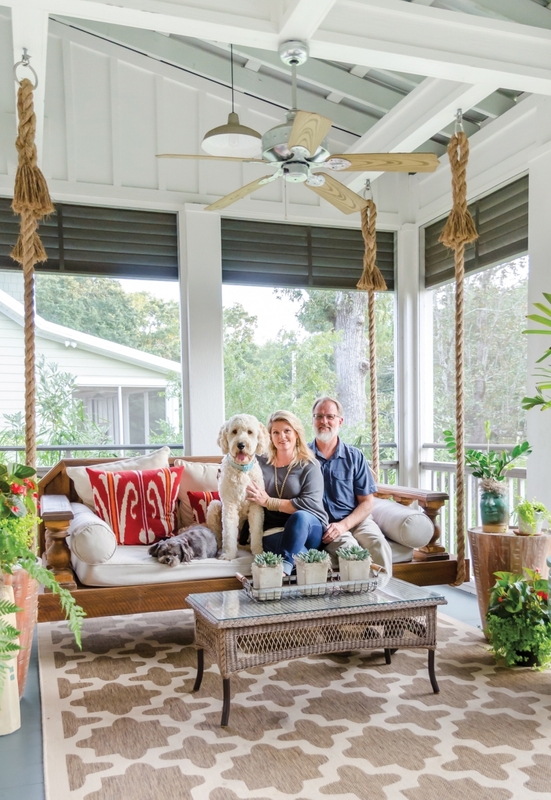 Vinny Barbarino, a little Shih Tzu with a big attitude, and Baylor the snuggly Goldendoodle will get to enjoy the beautiful new home for years to come. Paint color: Sherwin Williams Pure White. Chandelier: Natural beads in a grand silhouette are an interesting touch in the bath. 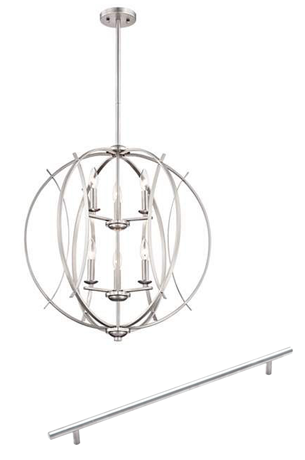 Similar to the McElmurry’s – Ro Sham Beaux 24” Quartz fixture • Malouf Furniture & Design • $2395. 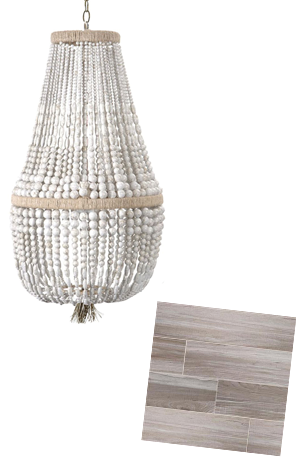 Bathroom Tile: Wood-look tile in Stormy Gray • Jubilee Flooring & Decorating • $5 per sq ft.